Overview In this release, we have focussed on searching and refactoring support for Intertype Declarations (ITDs) and Declare declarations. This will particularly benefit users of Spring Roo who will be better able to search and refactor source code that contains Roo-style aspects. Notice here that simple as well as fully qualified names are found through searches. Navigation (i.e., hyperlinks and F3) works as well. Wild cards are not supported. Type bindings are sometimes not respected, meaning that two types with the same name, but different packages may be inappropriately matched. You will notice that the search result for @Loggable inside of the declare parents is marked as potential. This means that we could not match on the fully qualified name, but only the type's simple name. 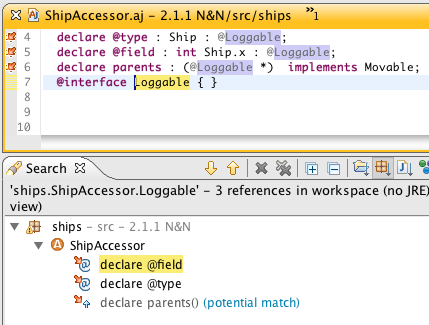 Field and method references in declare annotations are not returned in search results. See, Bug 327117. 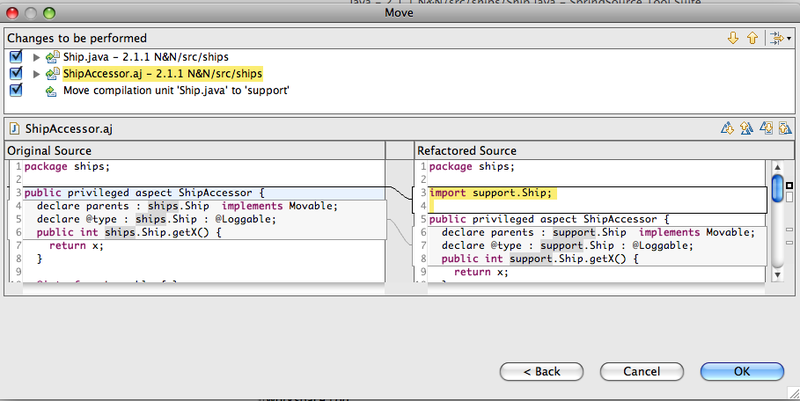 Hovers and navigation are not yet implemented inside of declare declarations. 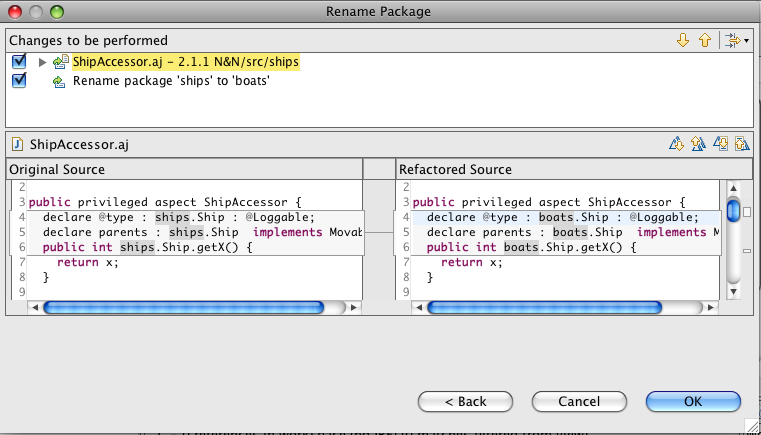 Rename refactoring Rename refactoring is working in almost all situations. 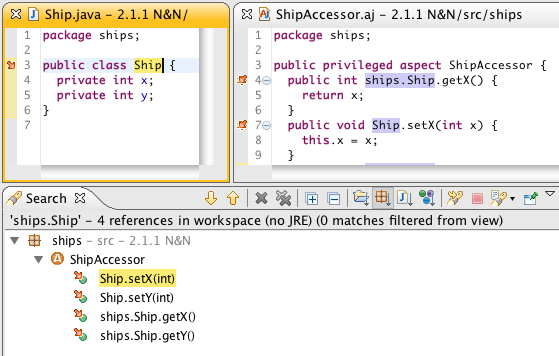 Intertype declarations can be renamed; fields, methods, and types referenced inside of Aspects will be appropriately renamed; and AspectJ Compilation units will be renamed when appropriate. Most of this work was completed for the 2.1.0 release, with some small fixes included in this release. AJDT does not currently support the renaming of named pointcuts. This message means that there are some type reference matches that the refactoring is not sure about. This happens because there are some situations where AJDT cannot determine type bindings and performs matches on simple, rather than qualified, names. This message can generally be ignored, but you may want to examine all changes to make sure. Note that currently, only drag and dropping of fields and methods into aspects are working. Using the Move Refactoring wizard is throwing exceptions. If you want us to fix any of the above refactorings, or you notice a problem with one of the existing refactorings, please notify us on the mailing list or raise a bugzilla request for it. AspectJ 1.6.10 AJDT 2.1.0 includes AspectJ 1.6.10. See the readme for details. Bug Fixes See bugzilla for a list of bugs addressed in this release. Previous Releases See here for information on the new features in AJDT 2.1.0. Thanks! Thanks for community help and feedback during this release cycle. You can contact the AJDT team on the mailing list, and raise bugs on bugzilla. We also lurk on the AspectJ users list, and on the SpringSource Tool Suite forum.